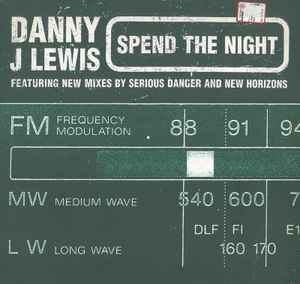 The "Original Mix" (B2) here differs to the 'original' mix of "Spend the Night" found on the "Four For The Floor EP" on Stronghouse Records three years prior to this release. This track is absolutely a staple of 90s UK Garage. As 1997-sounding as they come. Up there in legacy as "It's a London Thing". A must-listen. Wow, i cant believe no one has commented on this track! First thing, i cant believe that this was 12 years ago, that is scary. I remember listening to this on old Kiss mix CD's at the time. This and Nu-birth "Anytime" were THE tunes in the summer of 1998. This 4/4 Uk Garage sound was big, when you hear it, you can feel the vibe from it, that it was made in London, it just has that "feel". The mix thats the sure play here, is Danny Harrison's "H-Man" mix. Him and Julian Jonah enjoyed huge success around this time, and deservedly so with remixes like this and their 187 Lockdown material. The track has a nice breakdown which does sound lush, nice pads and some very nice female vocals (still dont know who did them), and it is proper hair on the back of the neck stuff. Then it drops into a sublime bassline, which is pretty much the whole track. The bassline is really something else, its got the funk. There was a vocal mix with Top Cat too, which surprisingly for the obligatory intrumental-add-vocals-for-the-charts type move, works incredibly well. I actually wish they pressed up the vocal version, as it is damn good. A seriously good track which is now considered "old skool" i suppose. I'd say a classic for sure, and up there with Nu Birth "Anytime". Definately one of Harrison/Jonah's finest moments. Although i was to young to go clubbing at the time (only 15), i bet this tune got hammered throughout the summer of 98, and i would have loved to have heard this in a club on a good system.